There is a consensus that global warming is a problem; not debatable. There is consensus that the magnitude of the problem has the potential to be ginormous; not debatable (the cause, extent, and likelihood of this potential are all very debatable). But there is no consensus on the solutions proposed, most of which have more holes than our own ozone (Kyoto), are as of yet unproven (carbon credit trading), or are downright scams (those firms like Terrapass which allow you to “offset the carbon emissions of your car” by PAYING THEM to invest in renewable energy sources or planting trees and crap. Note to the world: you and the rest of the world are likely better off just picking a random publicly listed clean tech pureplay and sticking all your ROTH IRA moneys into it rather than filtering it through these toll collecting middle men. This is the same scam as Fair Trade. And your part in global warming is only slightly played by driving cars, as the bulk of your contribution to the problem comes indirectly from actions you take.). This is when I use facts. Fact: There are more people everyday. 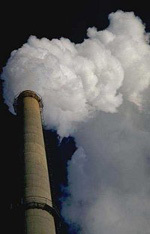 Fact: More greenhouse gases enter the atmosphere everyday. Fact: People need to eat. Fact: Greenhouse gases may lead to global warming. Solution: Make greenhouse gases more delicious. If carbon emissions were delicious, people would eat them, and they, the gases not the people, would either disappear or be processed into harmless byproducts based on science. Despite this obvious solution, there is not a single research scientist whom we’ve uncovered in our digging who is working on a way to make carbon emissions delicious. And it’s even worse than that. The millions of hungry mouths which are added to the world every week don’t demand delicious edible exhaust; they would almost certainly settle for edible exhaust, a much easier bar to clear for any potential edible exhaust innovator. Recommendation: In the current climate, there is a real opportunity for a company bold enough to place an R&D bet on the nascent “Clean Plate Tech” industry. But more than that for anyone with capital and a conscience, this is also a way to dollar vote for a better future for your children and your children’s children. It is a financial moral imperative to get this done. An SNCR works by adding a reactive chemical reducing agent (powdered sugar) into the flue gas in appropriate stoichiometric amounts so that it may react with the NOx molecules and undergo a chemical reaction into harmless byproducts.